For years, as a writer, I’ve shied away from the young adult category populated by the likes of Suzanne Collins and her Hunger Games and Stephenie Meyer and her Twilight series. Both descendants in some ways (it seems to me) of JK Rowlings and Harry Potter. Who, herself is a descendant of Tolkien. And so on. I shied away because I no longer had kids at home and was now engaged in writing screenplays in a few genres as well as detective novellas along the line of Chandler and Hammett. But once you make a type of commitment to a particular genre of writing (again, it seems to me) you need to be true to this particular genre. Otherwise you dilute the power of one genre with the symbols and power from another, competing, genre. The young adult category (that drew heavily on the fantasy and science fiction genres) seemed a threat to “diluting” the writing experiments I was presently exploring in the detective genre. I had just written a story, narrated in the first person, in the form of a novella. Somehow, though, you explore the other writers with their movies or books. I saw the first of the Twilight movies and was enthralled by it but then quickly forgot about following anything else in the genre one might call the Twilight Teen Vampire Romance Genre. And all about me in the Barnes & Noble Bookstores I go in, there are the Hunger books. They are in big inshore displays. The movies come out but I ignore them. The new new Hollywood star Jennifer Lawrence is born from the film The Hunger Games. Last week, I watched The Hunger Games for the first time on one of its many appearances on television. I couldn’t stop watching and the next day went out and got the book and have consumed it in a day. I had just seen the movie and knew the ending of the story. Knew what happens to the characters at the end of the book. Yet still, I have read the book with a new type of enthusiasm. I would say that it is the enthusiasm that (it seems to me) only a writer can have. It goes beyond worrying about the category of young adult fantasy the novel The Hunger Games is written in. The story The Hunger Games created by Suzanne Collins, goes beyond offering a threat to this particular writter. Rather, it offers up a new type of inspiration that words can still create emotion and feeling. And certainly, suspense. That emotion, one screenwriting guru says, between the two key dynamics of a film in the mind of the Hero or Heroine. The emotions of Hope and Fear. It is set in a dystopia of “Panem,” a country consisting of the wealthy Capitol and twelve districts in varying states of poverty. Every year, children are chosen to participate in a compulsory annual televised death match called The Hunger Games. The young heroine of the novel is Katniss Everdeen, a 16-year-old girl from District 12 who volunteers for the 74th Hunger Games after her 12-year-old sister Primrose Everdeen is picked for reaping. 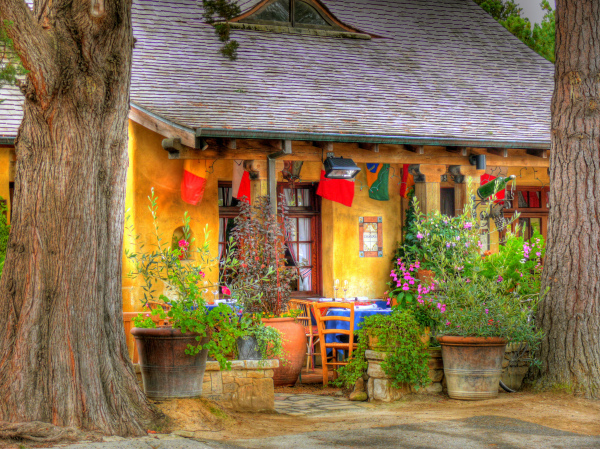 (I can imagine Katniss living in something like the photo above I took of Casanova’s Restaurant in Carmel,CA) Katness survives the games along with Peeta Mellark when they both defy the Capitol by threatening to commit suicide. I believe the real power of the story comes from a few major areas. The story really deals with the collective consciousness of the teenage world and the symbols and images it is trying to figure out at this particular time in their life cycle. It is for this reason that there has developed a particular type of symbol system (one might say) called the young adult fantasy genre of fiction today. It might be about young love like the Twilight series: romantic teen vampires. Or, it might be about simply survival today, like the Hunger Games. The Hunger Games seems in the middle (the Bullseye, better yet, the symbol for Target) of the current zeitgeist of the teenage mind. Suzanne Collins has made this connection to this generation. It is not exactly her generation, though. Really, a generation behind her generation. The world is not full of the romance of the Twilight series. The world of country of Panem is a bleak world. It is in effect the United States a few hundred years into the future. There has been some great war which has made the entire nation consisting of one capital in Colorado and 12 Districts (or states) of the nation now called Panem. The grand symbols of young people today are very apparent in the story that Collins has created. The capitol is a symbol of the upper class of the current culture and society of the nation. where all the wealthy in the nation live. The twelve districts of the nation have various skills and talents. There is a twelve fold division of labor in the nation of future nation, America. There is a dynamic between a mothership symbol or planet like the Capitol in the story, with other planets like the Districts rotating around it. This capitol/district dynamic symbol of the story is joined by another powerful symbol in the story. That is the symbolism of the woods in the story. The hunt that is associated with them. Like many fairy tales of past years, it dwells in its most magic movements in the woods of the story. Magic helpers and mentors to Katniss appear in the woods. She questions whether she can trust them. So much a question with young people in our age and time. The people one meets in the “woods” of the current world today, where everyone seems to be either a hunter or someone hunted. Add to the above, the symbol of the young first person sixteen year old girl who is relating this story to us. Her voice is true and simple. Not much more complex than the voice of Huckleberry Finn or similar, but not as nasty, as the voice of holden Caufield in Catcher in the Rye. Yet I found the brilliant world of Hunger Games represents more than a story or book today. More than the trilogy of Hunger Games books Collins has written. A particular voice that is true to its narrative self. A distinct personality is created in the voice that narrates the story to us. It is a personality that many young people identify with today. A type of archetype of a generation. The young adult generation today. Another element that Collins provides masterfully in her story is suspense. In fact, it makes one feel again (for the first time in a long time) that words of fiction still have that certain power over in one’s life. In one’s spirit. When the story is as good and powerful as The Hunger Games, it attracts generations far away from its target audience to it at times. This power I feel in Hunger Games is based on Collins’ use of suspense or constantly keeping the reader in that space between hope and fear called suspense. She is brilliant in keeping the two in constant conflict. The two symbols in rising battle throughout the story. They battle each other in Hunger Games better than the forces in detective novels I’ve read. Again, some genres of books you try to avoid because you think they dilute the power of the symbol system you are trying to work in. But other genres inspire you rather than threaten you. And stories – like Hunger Games – helps one see and feel what goes through the minds of young people. Especially when my generation – the baby boomers – are far away from the Hunger Games generation. Yet the symbols Katness has to deal with – living in an “outlying” district and subject to a great capitol city (here on the western side of the Rocky Mountains), learning to trust people in a strange new world of cyber crime and jihadists, learning to live with suspense in life, a perpetual hunt to exist. An honest, trustworthy, voice. Like the Hardy Boys or Nancy Drew books of my generation. An emerging symbol of the young adult book market – the generation in culture ready to take command of the nation in five to ten years. I read Hunger Games with growing respect. I wonder how one might go about setting a detective story, with some aging detective, in a future state like the nation of Panem in the Hunger Games. I wonder how you mix the two. Collins does it with the character the mentor’s Katness. And with the character of their hostess who takes them to the capitol on the bullet train. There are the controlling people of the games. The television show MC. The head of the capitol. Those controlling the game. But most of the rest of the cast in the story children and teens with ages going down to seven years old. In a sense, the fantasy world of Hunger Games melds with the noir landscape of detective stories, those of Hammett and Chandler in particular. The woods Katniss is placed in are similar to urban places today, like Los Angeles and San Francisco. The streets of these big cities where detectives searche for clues. In the same way that Katniss searches for clues. A detective in her own right. Like all young people are in a natural way at this point in their life cycle. The genre of older male characters and readers called detective fiction might learn much from Hunger Games. One tries to call the mystery of being a detective in life back into one’s life. But it is difficult to do because it is far away in time. Through the symbols of the Hunger Games, someone writing in an older male, genre like detective fiction can see how the detective spirit is a product of youth. And how it is good for all of us from older generations, to take a few hours to get a glimpse into the world of today’s young people. With Harry Potter it was magic and sorcery. With the Twilight series it is supernatural vampires and teen romance. With the Hunger Games it is basic survival against the state or the Capitol of Prem. Twelve states or districts support the wealthy town Capitol town. Is there an evolution of themes with these authors? Our world today (in 2015) seems more symbolized by the landscape of the Hunger Games than the old castles of Harry Potter or the green hills of the Hobbitt. Or the Hardy Boys or Nancy Drew books. Other writers from other genres can learn something about what is on the mind of young people. The type of world they inhabit. And they can remember what was once on their mind when they were young people themselves. Maybe they can use this memory to create new types of stories. We all branch out into various genres after those years of our youth. Those years now called young adult as a literary market. All writers are at one time young adults reading the main literature of this group, influenced by the same common symbols. Memory more than anything brings these original symbols back in mind and perhaps into new literary projects.